With the Galaxy S7 and Galaxy S7 Edge, Samsung brought back the microSD card slot to much delight. While they may have skipped on Android 6.0’s Adoptable Storage, there may not be that big of an issue, because they are still allowing you to move apps over to an inserted SD card and take advantage of cards up to 200GB. Since many of you may be coming to the S7 or S7 Edge from a previous Galaxy device and haven’t seen Samsung’s newest implementation of an SD card slot, we thought we’d share that with you today. If you are coming from a Moto X Pure Edition, you’ll know how this works, but what Samsung has done here is turn the SIM tray of the phone into a microSD tray as well. 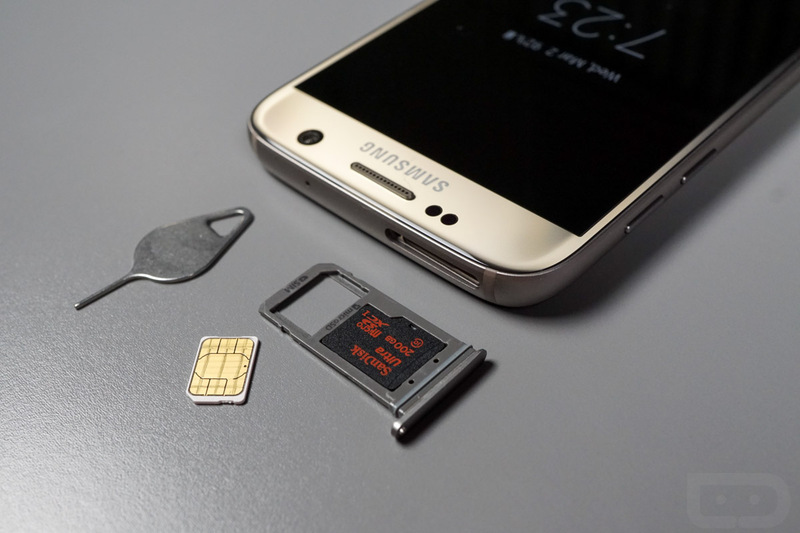 The SIM tray (and the S7 takes a nano SIM) is located at the top of the phone and can be ejected by using the included SIM tool that Samsung left in the box with all of the phone’s guides. All you have to do is slot the tool into the pin-hole for the tray, apply a bit of pressure, and it will pop right out. Now, once you have the SIM tray out, you’ll notice there are two slots: one is for your nano SIM and the other is for a microSD card. In the video below, you’ll see exactly where to put each, but you’ll also see how delicate and careful you need to be when doing so, especially as you slide the tray back into the phone. This isn’t a difficult process, but again, just be careful. Galaxy S7: First 10 Things You Should Do!